I followed the recipe exactly as I always like to do that the first time I make a recipe (though like other reviewers I used less oil). I wouldn't leave the skin on the sweet potatoes again unless they were a thin-skinned variety. I had to remove the skins off the wedges as they were inedible. It's definitely the dressing that makes this more interesting. I added half a finely chopped preserved lemon as I thought that went well with the capers. I like stephengk's idea of serving this with halloumi. Served with fried halloumi. The sweetness of the dish worked well with sharp tangy cheese. Have subbed carrots for sweet potatoes. My first impression was of a good simple recipe made unusual by the addition of the garlic heads. Then I made it in a Cuisinart roasting pan and became something else again, something excellent. I would however swap the parsnips for another vegetable. They are an acquired taste. And one member of my family has just not acquired It. This is just roasted vegetables with a caper-heavy dressing. I don't think the vinaigrette really added that much and the selection of vegetables was merely fine. A nice mix of veggies, capers, and sharp/sweet dressing. I used less oil. Liked it. Another rave review here. We loved this, and the capers managed to go unnoticed by the suspicious 9 year old. I added a small squash that needed eating to the mix. I will bookmark this recipe in my 'favourites' file. This combination of rich roasted vegetables and lemony vinaigrette was incredible. While we aren't big fans of sweet potatoes (except as fries or tempura), I decided to try it with the vegetables as written in the recipe, and both my husband and I loved it. Getting to squeeze the soft roasted garlic on top is definitely a bonus. 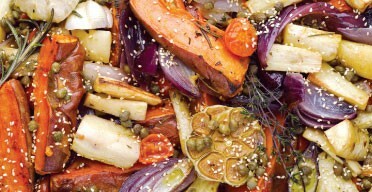 This would also look gorgeous as a holiday vegetable dish, and the vegetables are very appropriate for winter. This works exactly as advertised in perking up roasted veg with the acid hit of the vinaigrette. Really wonderful dish. I used cauliflower, yellow onions, and sungold tomatoes. The cauliflower only needed to roast for about 20 minutes, then another 10 with the tomatoes. It was delicious. Pg. 16. This was really good, and even better on the morning of the second day for breakfast! And I'm looking forward to more leftovers for dinner tonight -- this does make an enormous quantity. It's quite a versatile recipe in that you can basically use any root vegetable in this dish. I did stick with the parsnips and sweet potatoes because I had a lot of both and needed to use them up. I really liked that none of the vegetables burned; the cooking times and temperature seemed to be about perfect. The amount of olive oil seemed excessive to me, so I did halve the amount that was tossed with the vegetables. In the future, I would add the garlic cloves separately. To cut down on fat, I might also skip the vinaigrette, although not the capers -- they're a really nice addition. I did not add the sesame seeds.